Names on this page represent an always-expanding network of Charitable Words Scholars volunteer advisors, who bring their connections to hundreds more. The network include professionals in communications, marketing, nonprofit management, and social innovation. They provide guidance and connections to pro bono resources to enrich student experiences. Their engagement exponentially leverages returns on investments in “Learning and Lending a Hand” internships and collective impact for nonprofit partners. Jennifer Feld, senior art consultant at Artonomy, Inc.
Michelle Foster, media management and marketing consultant, Washington, D.C.
Dr. Suzanne Kunkel, Director of the Scripps Gerontology Center, Miami University, Oxford. Leisa Wilcox, Vice President, Once Blind Studios, Nashville. 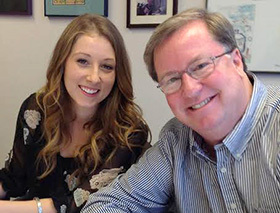 Pictured: Professional photographer Jim Callaway provided mentoring and guidance to Charitable Scholar Rachael Shepler during her internship with The Alzheimer’s Association of Greater Cincinnati.